Vita Mass Hgh Patch is a specifically formulated for any man or woman with demanding and consistent workout or exercise regimens. Vita mass exclusive time-release transdermal patch delivers this directly into the bloodstream over an 24-hour period. This time-release function allows one’s system to efficiently process and metabolize all of the formula’s GH nutrient dosage. 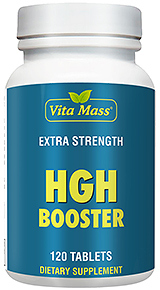 The Growth Hormone in the Vita Mass HGH Patch is the exact genetically engineered molecular equivalent of naturally occurring human growth hormone created by your body’s pituitary. 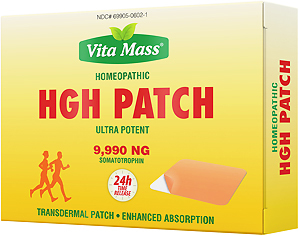 Vita mass HOMEOPATHIC Ultra HGH Patch is the most powerful supplement available in the Market without a doctor’s prescription. The formula is safe and effective. Note: All Vita Mass products are Doctor formulated and researched. All of our ingredients are USP, food grade and of the finest quality. It helps to regulate your hormones and it is a great supplement to take as you grow older. HGH Patch Ultra Potent 9,990ng is a very good product. I have used this product and got a good result. I absolutely love the product and the extra energy it gives me. Place HGH Patch on skin between elbow and wrist and leave on for up to 24 hours or remove after 12 hours and re-applied to a different skin site at the same time each day. Use 5 days a week or as directed by your health care professional. Warning: Do not use if pregnant or nursing. Keep out of the reach of children. If irritation or redness occurs, discontinue use. • Use a fresh seal each day, 5 days per week.